“At the mouth of two or three witnesses shall the matter be established.” This biblical axiom is scattered through the Old and New Testaments. And why shouldn’t it be? It’s actually not a bad rule. Certainly, in modern courts of law, when more than one witness independently corroborate a story, the story is given credence and becomes believable. In the Bible, this rule is the premise for excommunication, defrocking, and capital punishment. Yet, this foundation for establishing truth is trampled underfoot in almost every occasion related to the most important circumstances in all of scripture – the interactions between the God and man. No other person heard or saw the burning bush where the voice of God commissioned Moses to become the deliverer of the Israelites from Egypt. 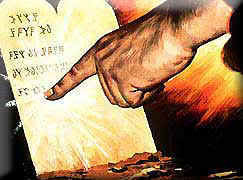 No other person heard or saw God deliver the Ten Commandments to Moses on Mount Sinai. No other person saw God pass by Moses while he hid behind a rock. No other person heard God tell Noah to build an ark. No other person actually saw a whale swallow - then subsequently vomit out - Jonah. No other person heard God tell Solomon to ask for anything he desired. Certainly, anytime a prophet communicated with God, it was a one-on-one conversation. Even the angelic messages to Mary and Joseph were delivered individually to each. No one else saw or heard the conversation between Paul and glorified Jesus on the road to Damascus. “At the mouth of two or three witnesses shall the matter be established.”This observation is not confined to biblical accounts. I can think of no account ever provided by preachers, evangelists, missionaries, apostles, and overly zealous Christians when a message from God was delivered and witnessed by more than one person. No other person heard God tell Oral Roberts that he would die if he didn’t raise 13 million dollars. Whenever Jimmy Swaggart, Ken Copeland, Jim Bakker, Jerry Falwell or Ernest Angley started a sentence with, “God told me…” then it’s a safe bet that no other person heard this conversation. This observation can even be extended to the angel Gabriel delivering the Quran to Mohammed, the angel Moroni giving golden plates to Joseph Smith, or when Mother Mary appeared to 14 year old Bernadette Soubirous near Lourdes, France in 1858. There was no other person present during these events.